Though this question is probably only relevant to birders in the midwest and northeast of the United States I feel compelled, like last year, to ask it. 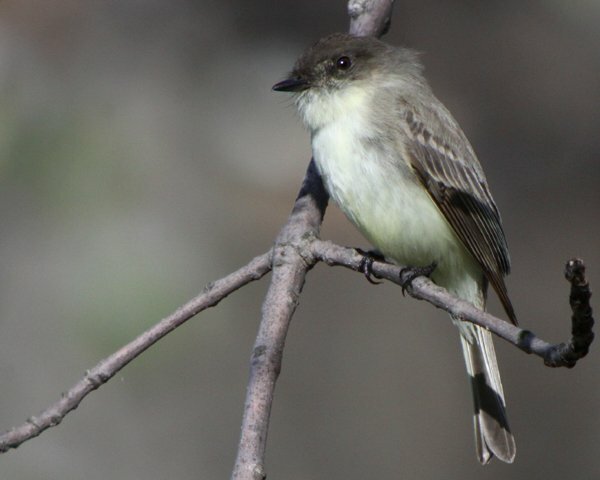 Have you seen your first Eastern Phoebe of 2012? When? Was it earlier or later than usual for you? This year I had several first phoebes. I saw one on Long Island way back on 08 January but that was clearly a bird attempting to winter. (And as far as wintering birds I had them on my trip to Florida as well.) My first migrating Eastern Phoebe of the year was at the Oradell Reservoir in New Jersey on 15 March, slightly earlier than my average of 19 March. My first migrating phoebe in New York wasn’t until 29 March at Forest Park in my home borough of Queens. When did you get your first phoebe of the year? And if this game doesn’t apply to you I am sorry…but my first phoebes are too cool to not post about! I saw my first 2012 phoebe in Windsor, VT on March 21, which is about two-and-a-half weeks earlier than I normally see them in Vermont. Windsor is in the Connecticut River Valley, where migrants seem to show up a bit earlier than they do further north and west where I live. That probably only accounts for a few days though. My first phoebe was March 12. This is not profoundly early, which surprised me after the non-winter. I’ve had my first phoebe anytime from March 8 through March 26, with most first sightings between March 12-17. My first phoebe was a single bird at Fort Totten Park in NYC on March 15. In previous years it was a little later than that. My first Eastern Phoebe this year was on March 17, which is in line with previous years. March 16 for me (in minnesota), which is about 2 weeks earlier than the last couple of years.